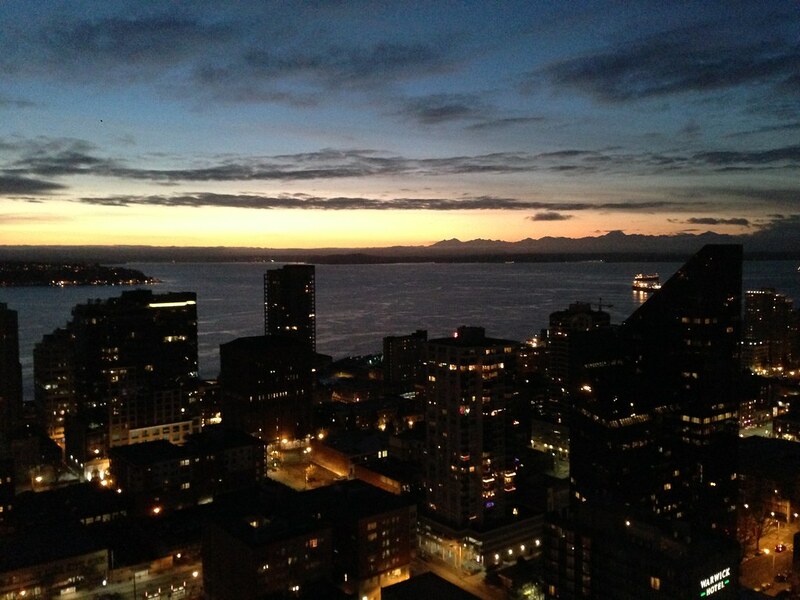 During my second visit to Seattle over in December, I stayed one night at the Westin and another 2 nights at the Hyatt at Olive 8. 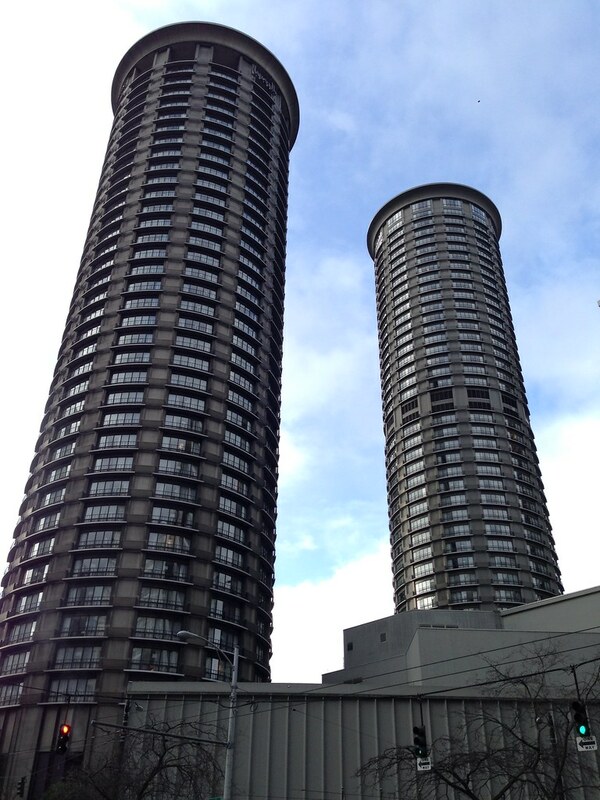 Both hotels are located close to each other on the northern fringes of downtown Seattle. The Westin is unmistakeable for its twin cylindrical towers with its main entrance located along 5th Avenue, and the monorail tracks prominent at its doorstep. 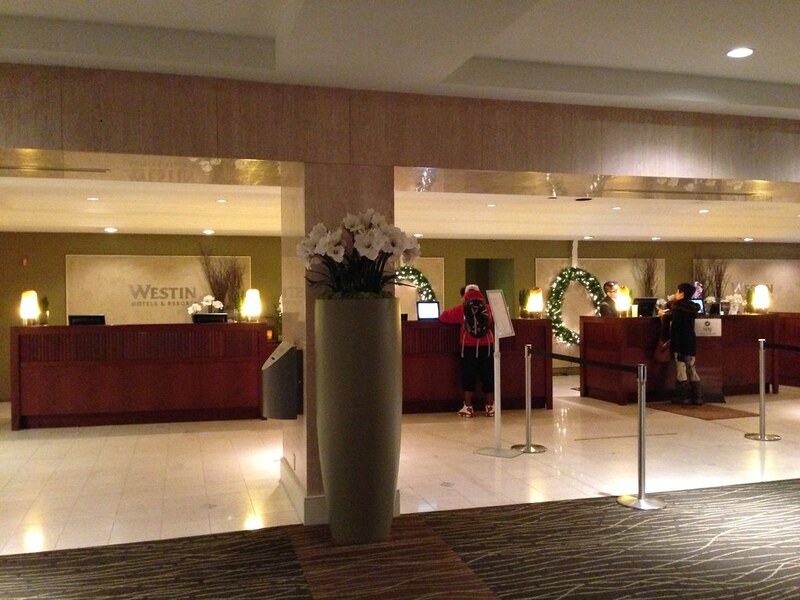 Amongst Seattle hotels, the Westin is one of the largest which means rates can be pretty cheap when occupancy is low or can get high when there is a convention since there is a large meeting/convention space in the hotel. 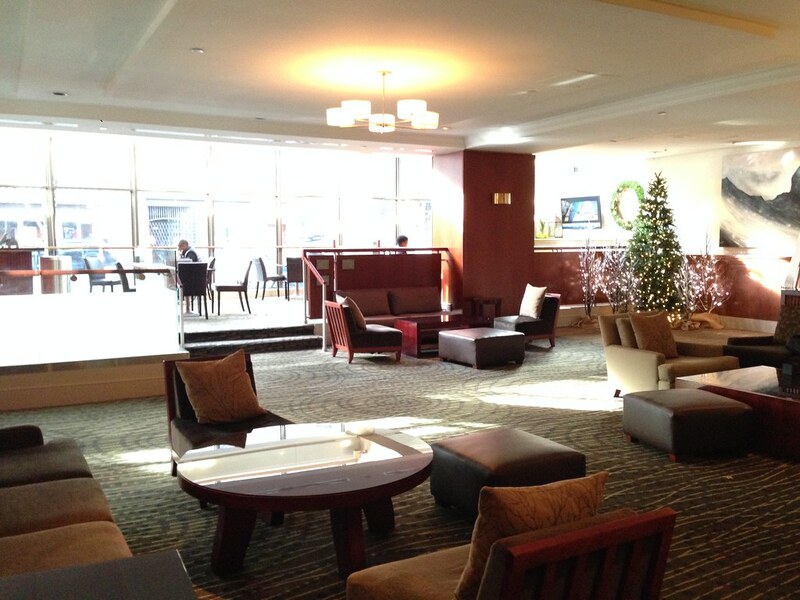 Being a business-oriented hotel, the lobby can get quite busy and it is quite large with lots of lounging space. In fact on the night I arrived, I noticed a group of guests playing cards, occupying one of the spaces. Not that there is anything wrong in that since there were still plenty of seating spaces and they were not rowdy at all. There is also a bar counter in the lobby lounge which serves beverages and where guests can order some food to take-away. I actually ordered some food from here since it was Christmas Eve on the night I stayed and I had made no dining plans in the city. There is also the Relish Burger Bistro on the lobby, right by the main entrance. I arrived at the hotel just slightly before sunset and there was no queue in the reception desk but on the day I checked out, I did notice quite a long queue, which can be the norm in these large scale convention hotels. Also note that the hotel has 2 towers, the North and the South. 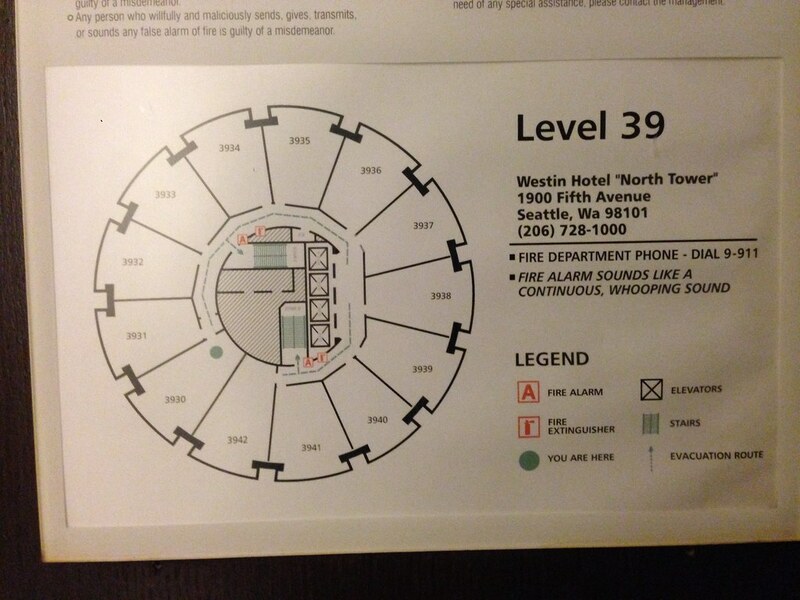 I was assigned a room in the North tower which demands a short walk to the elevator lobby. 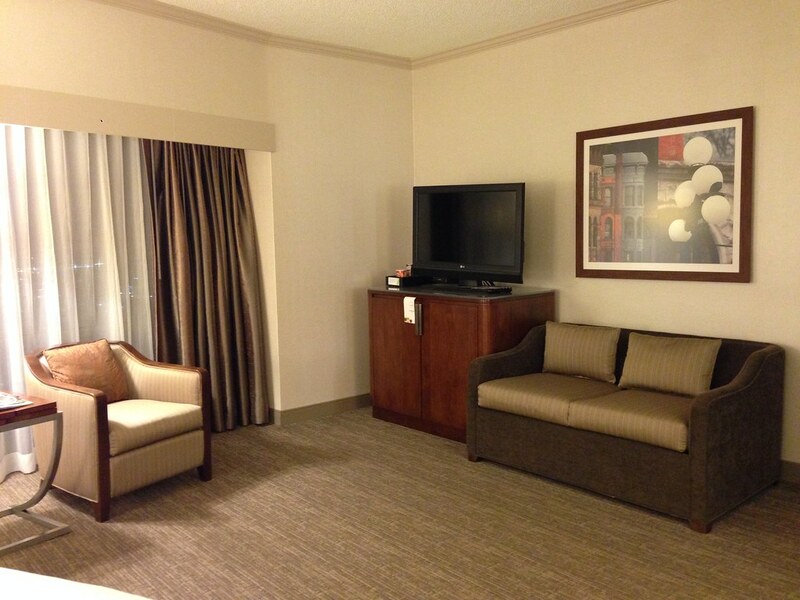 For my stay, I was upgraded to their Grand View King room, which is one of the highest category of rooms. I did not enquire about suite upgrades since it was only for a one night stay and the check-in agent did mention about the upgrade already. Since my first impressions of this property was just average at best, I picked the 500 points as I thought I could do better breakfast at the Pike Place market. I had paid a rate of $169++ which is a shopping package that includes a $100 Visa debit card so the stay was quite affordable overall. Being a tall hotel, there was 4 elevators but 2 was out of commission and I guess the hotel did not bother to service them before the festive season. So it took some time to wait for the elevators, which is again a negative in this property. On entrance to the room, there is a standard bathroom though Westin did change the shower-head to a rain-shower style which seems to work better but still nowhere close to a premium experience. Amenities are Westin-branded which is not bad. The bathroom was also a bit smaller than usual due to the space constraint as each room is shaped like a pizza wedge and the bathroom is located by the entryway which is also the narrower portion of the wedge. This is more of an architectural constraint due to the building’s cylindrical shape. 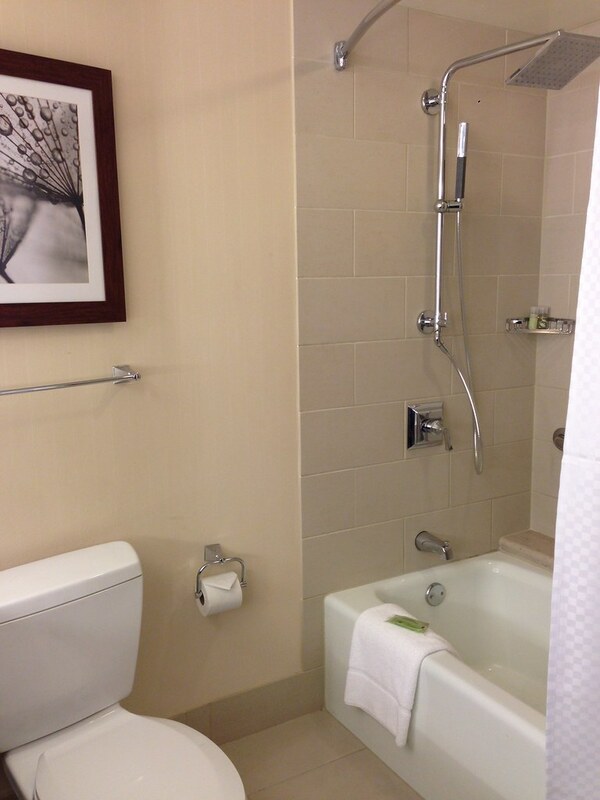 While the bathroom are pretty small, the room itself is spacious and could even count as a Junior suite. However do note that some of the Grand View rooms have double beds which can make the space slightly feels more compact. The room featured a King size bed, a lone armchair with a desk by the window and a small TV cabinet and sofa by the wall. While it is big, the location of the sofa and TV cabinet leaves much to be desired as guests seated by the sofa cannot watch TV and there is only one armchair to enjoy the view! This room definitely works for one person occupancy only. 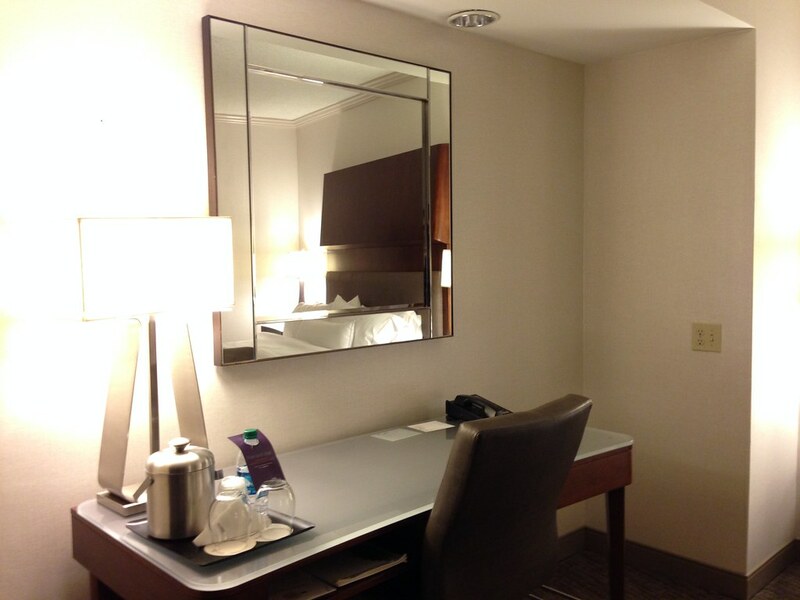 Beside the bed, there is also a dressing table and work desk of sorts, along with those swivelling work chairs. Somehow with the space, I think the hotel just placed furniture to occupy them without sparing much thought into the use of the space by hotel guests. As to be expected from the name of the room, the highlight is the view of Puget sound. Being located on the 39th floor also helps in enjoying the sunset that evening from the room. It is just too bad the Space Needle has been blocked by another tall condominium property though the lights on its spire is still visible from the northwest facing rooms. For what it is worth the rooms ending in -30 and -42 should have the best views and amongst the largest. 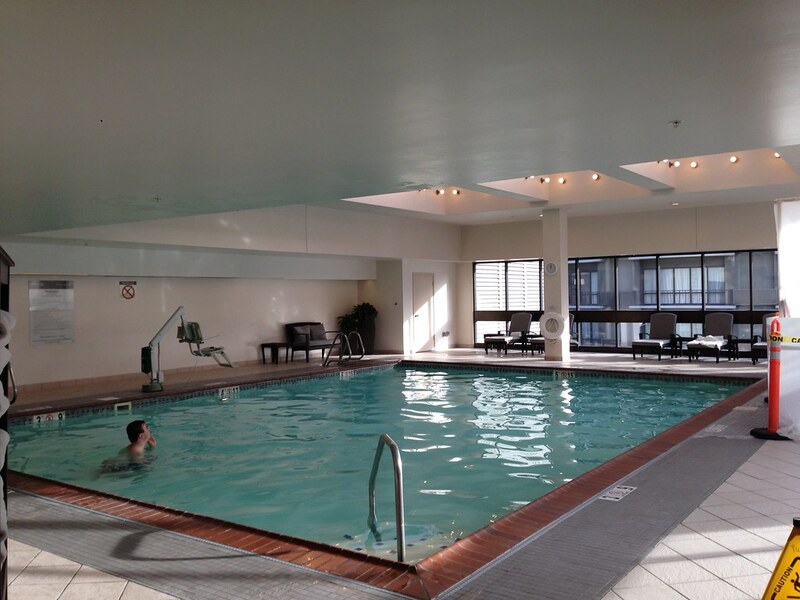 During my stay, I also managed to check out the indoor swimming pool and the fitness centre in the hotel. The indoor swimming pool is quite alright for a business hotel and being indoor, it makes it very useful in the Pacific Northwest. The fitness centre though is a joke, being a bit like a small tool shed with some weights and just a few equipments. 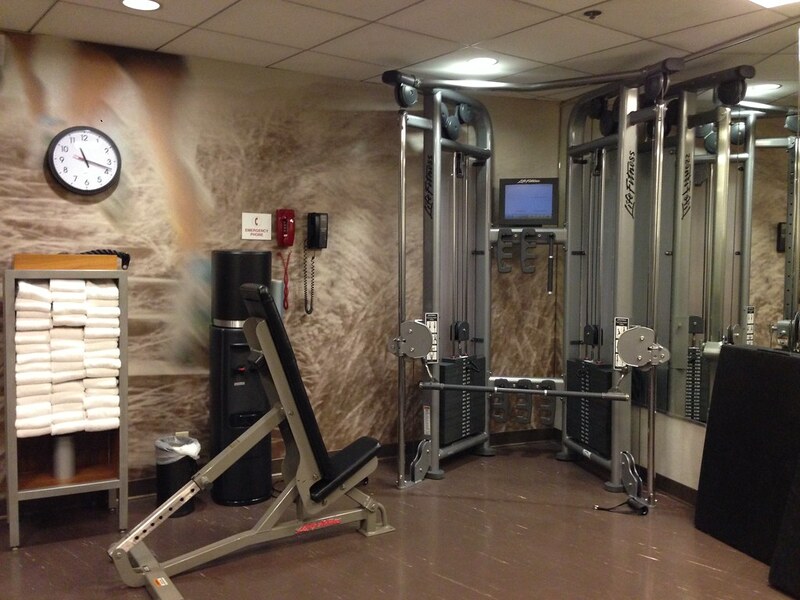 My point is that if you’re looking for a good workout while staying in Seattle, give this hotel a pass. With regards to the service in the hotel, do not expect much personalized service but they did alright. Nothing beyond what was necessary. And no issues with getting a late check-out either but there was a small issue with my bill as they actually charged me for a minibar snack that I did not consume. 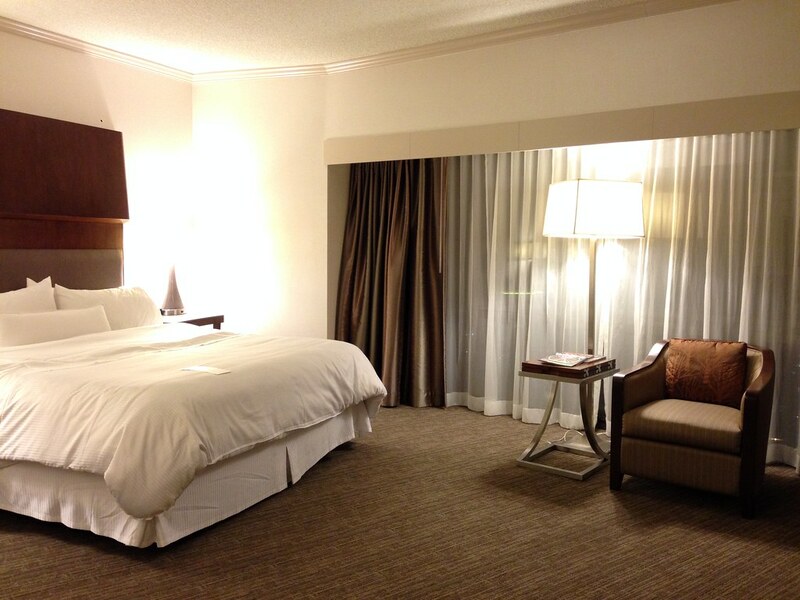 At the end of day, the Westin is purely average, but if you insist on staying at a Westin, head to the one in downtown Bellevue, WA instead. 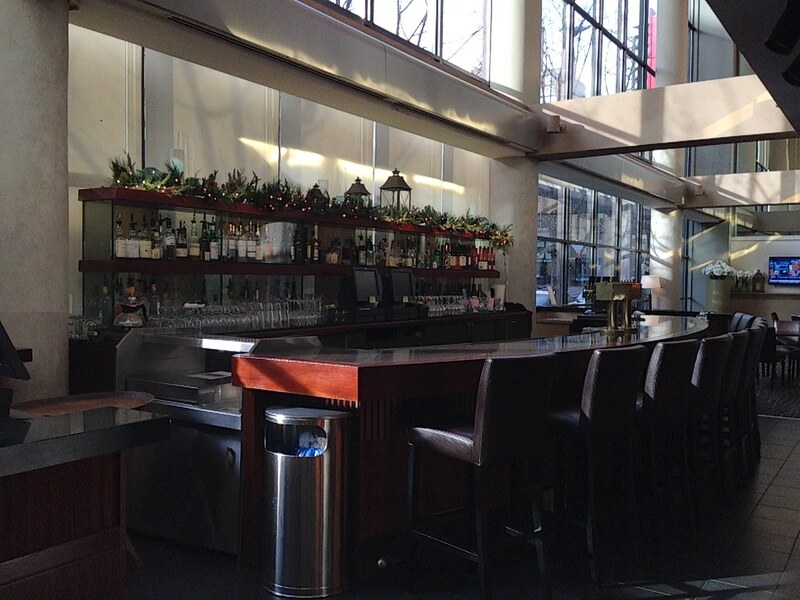 Amongst the Westin, W and Sheraton in downtown Seattle, I would give the nod to the Sheraton for its best location and better platinum recognition along with the club lounge in the hotel. Plus rates at the Sheraton are usually cheaper too. However if rates are about the same, the W is probably better property for those without any status with SPG. Well, doesn’t look very good. 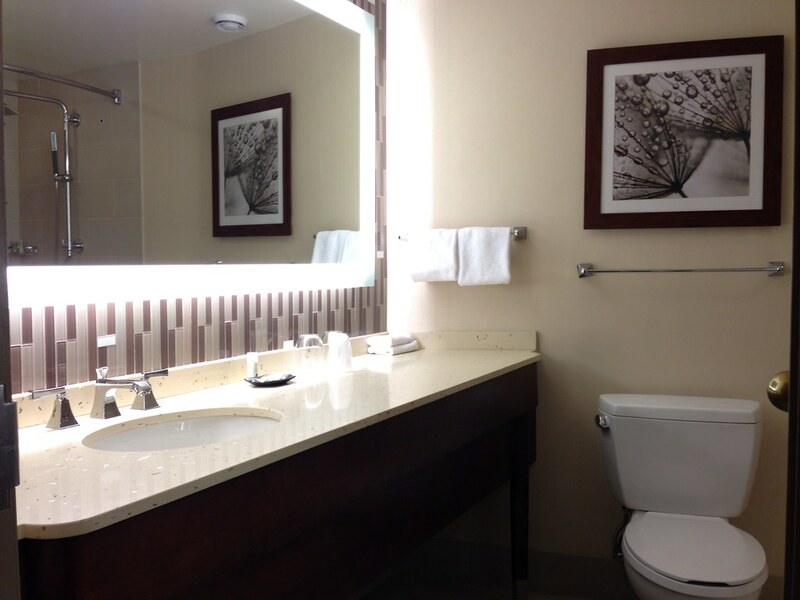 Especially the bathroom is horrible in my opinion. Not the best choice in Seattle. Indeed, but their rates can be quite low at times and the view is also one of the best if that is important.